The approval for "Peter Benfaremo Way" now needs city council support. 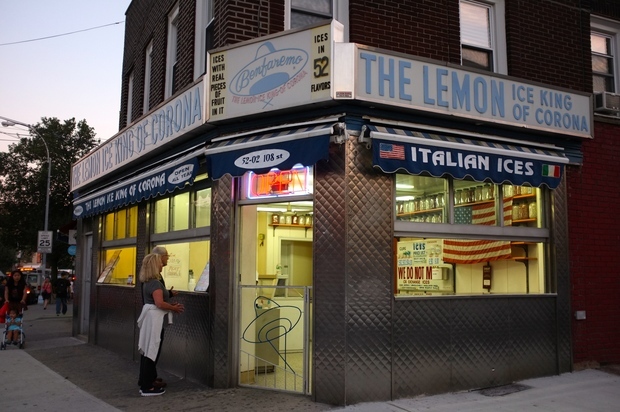 Community Board 4 unanimously approved a motion Tuesday to rename the corner of 108th Street and Corona Avenue after Peter Benfaremo — better known as the "Lemon Ice King of Corona." The famed Italian ices stand opened on the corner in 1944, when it was a predominately Italian neighborhood known as Corona Heights. Benfaremo's father, Nicola, began the shop but it was Peter who became "the King," his family says on their website. At Tuesday's general meeting for CB4, district manager Christian Cassagnol read a letter from Vincent Barbaccio, a co-owner of the shop who requested the renaming. Benfaremo remained loyal to his corner of Queens, lived in the neighborhood and hired countless local kids to scoop out the Italian ices, made with real fruit pieces, the letter said. The board unanimously approved the petition for "Peter Benfaremo Way," with one member saying it was a no-brainer. "He's the king!" she declared. The proposal now needs support from the city council in order to get finalized.